Airbus earned EASA certification for its fuel-saving Sharklets on its A320 family of aircraft. The Sharklets are made from composites, and attached to the wing-tips of the A320 to reduce aircraft fuel burn. 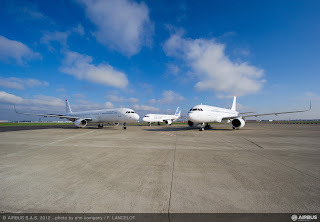 Airbus is still waiting to receive certification of the remaining aircraft/engine variants with Sharklets, and said it believes the European airworthiness certification would soon be followed by FAA type certification. Air Asia will become the first airline to operate Sharklet-equipped A320s on commercial flights starting later this month, the company said.